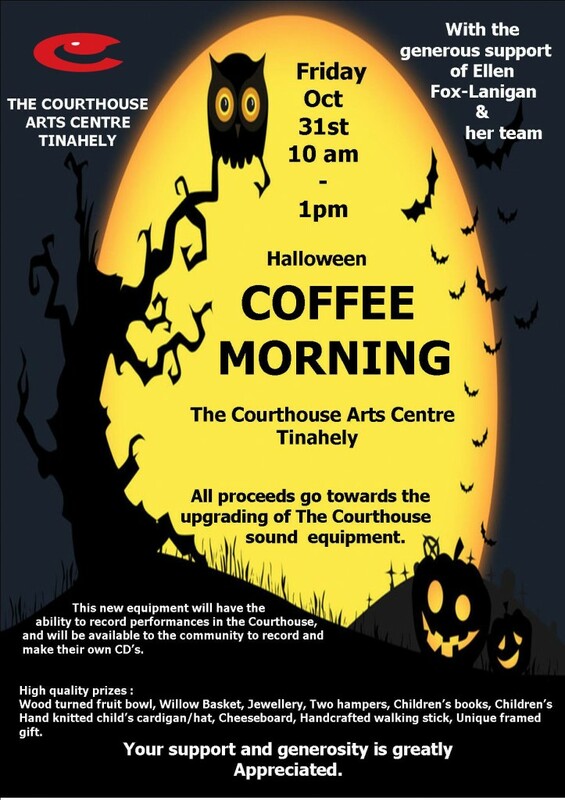 Halloween Coffee Morning – Tinahely – Friday 31st October 10 a.m – 1p.m. “The courthouse Arts Centre Tinahely will be getting into the Halloween spirit with a fun and spook-tacular coffee morning on Friday 31stOctober , 10 a.m. – 1p.m. The place will be transformed into a Halloween haven with decorations, characters, creatures and much more. Most definitely a must see! Come to the Courthouse for a cuppa, delicious home-made cake and a fun Halloween experience. Halloween attire is optional. Everyone is welcome! Thank you, as always for your generous and wonderful support”.